Warning: Not to be followed by present day kids. Remember those college days. The most fun filled phase in our life. I stepped my right foot inside my college on a rainy day (October 3 ,1999). The memory is still fresh in my memory. I saw a whole bunch of hyper-fun-craved souls eager to take a ride on a 4 year course called Engineering.Renu was not physically present with me at that time. But she occupied the entire breadth and depth of my mind. The next four years gave me the best experience I could have ever dreamt of. I had friends from different parts of the globe. Some big and some small like me. Some nutty ones and some bad bozos. The class room lectures, the ragging sessions, fun in the hostel, bunking for a living, exam time, combined studies, college tours, sports events, dance and musical shows are still fresh in my memory. After nine years, I went back to my college to refresh my memories. Believe it or not, I experienced Goosebumps for the whole two hours I spent inside the college.Two of my classmates, "Bernard and Ram" accompanied me to college that day. We went and sat in our classrooms. We could picturize our lecturers scribbling on the board. We also searched in the benches for the great inscriptions that were carved by us in those days. Finally When I saw the words ," Leena" Inscribed in one of the benches, a smile curved around my lips. Leena was my "process control" professor. Then we went to the canteen and had food. The quality of the food is stil the same. We went to the hostel which was inhabited by the present day college kids. I went to my room and sat on my bed. I can't describe the feeling. We even went to the college auditorium. The last time I went there was for my farewell speech. 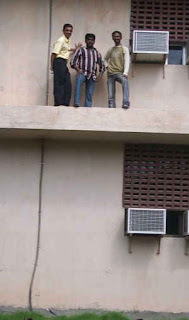 Each and every single word that I spoke five years back flashed across my mind.As the emotions were getting on a high, we three guys decided to enact a few acts that we did in our college days. We wanted to capture it on camera and wanted to have it for our memory's sake. 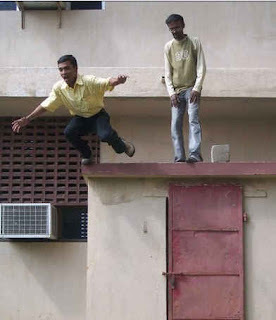 We wanted to do lot of things that we did during our college days. 1) Writing answers for the examination questions in a small chit of paper. 3) Escaping from the action scene sans getting caught by the professors. But there was a big complication always. 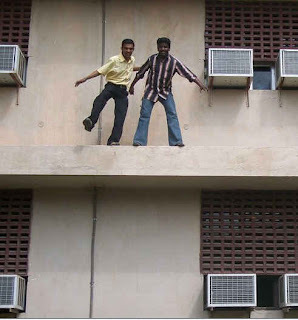 The examination normally happens in the first floor of the building and hence the act also involved a lot of climbing and jumping to do. We have had bruises and ligament-eruptions on such occassions. The Ambulance pictures and the crying-agony pictures are not added here for the author's own well being.Children are requested not to try this at home/school/college and even in their blogs. yehhh we all get those goosebumps when we travel back in time..
haha.. i agree that this blog is a lie factory..
and i have the same fotos in my orkut album too..
You dont need to commit sucide..sachi..:D..m right hre! haha.. you are also an instrumentation grad? When I'm still doing school..i feel sad for you guys..and being students..we never cherish tht time..we keep cursing that period..and hope to become adults n move outta school really soon! !..